Samsung Galaxy S8 Active was officially announced today, disproving the theory that an all-screen phone has to be delicate, too. This one is not. It's a shatter, dust and water-resistant Android phone meant for everyone, from outdoor enthusiasts to hard-working parents, according to Samsung. Oh, and by "everyone," Samsung means only AT&T customers. This one is a US and AT&T-exclusive, just like the S7 Active and S6 Active before it. Its metal frame and bumper provide extra ruggedness, enough that it can be dropped from 5 feet without much worry. It has a shock-resistant structure. Yet it still matches the Galaxy S8 with its expansive 5.8-inch display, quad HD resolution, Super AMOLED panel and taller-then-normal 18.5:9 aspect ratio. It doesn't skim on the screen space. It is, however, missing the elegant S8 curves and it doesn't really have an 'Infinity Display.' All around, there's more bezel that makes the phone a bit larger. But its dimensions are not as big as the Samsung Galaxy S8 Plus. The phone has a bigger 4,000mAh battery, too, giving it a real boost for your long travel excursions compared to the 3,000mAh S8 and 3,500mAh S8 Plus batteries. 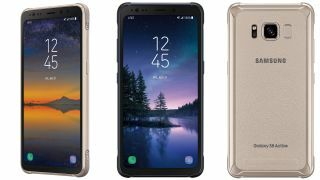 The 5.8-inch Samsung Galaxy S8 Active actually costs as much as the 6.2-inch Galaxy S8 Plus. All of that extra armor really adds up. The S8 Active price is $28.34 a month for 30 months with AT&T Next, while the full retail price is $849.99, coming in either Meteor Gray or Titanium Gold colors. It won't cost nearly as much if you seek two Samsung phones. AT&T is offering a Buy One, Get One Free S8 deal if you are adding a new line and DirecTV, for example. Pre-orders begin tomorrow, Tuesday, August 8, while the phone goes on sale Friday, August 11. We'll have a full review of this rugged smartphone soon, one complete with water and drop tests.